Titanic Cliche: This Ship Is About to Sink! Wow. Most commentators just limit comparing to reshuffling deck chairs on Titanic. He cannot resist using Titanic three times to get his point across. Well done Mr. Hartman. Not many can do that. For that we award you the coveted Titanic Cliche of Day Award. Anger has erupted over the £50 entry fee to the Thompson Dry Dock in Belfast. The charge is for foot, bus, or taxi. There is also a parking charge. You can avoid the charge by taking a tour bus that prebooks (and thus includes the fee as part of the tour). Many worry it will drive away tourists. The bosses say it is not about making money but safety issues. And that if you take a prebooked bus tour it will not be a problem. Except if you are on a bus not prebooked. Then you have to get off and line up to pay the entry fee. Those paying gripe about it and of course the cashiers have to deal with long lines of people. So let me get this right. If you prebook through a bus tour than includes the Thompson dock yard, you can go right in. All others, line up and pay. This is not uncommon. Many attractions and parks here in the United States have entry fees. Bus tours generally include the fees as part of the tour so you do not have to line up to pay. Belfast might want to consider what San Francisco does. There are special passes that allow people to not only travel on city transport but also includes the entry fees for some attractions on Fisherman’s Wharf (and other places). That way people who do not want to take bus tours can purchase those passes (usually good for one or three days). Make them easy to purchase online, at a retail store, or special outlet. Make some family passes as well. Things are heating up in Britain these days as Labour decides to go after the upper class with new taxes. This prompted Conservative leader David Cameron to compare Labour leadership to Titanic’s captain. After two years of spinning next to city hall, the Big Wheel is finally coming down on 11 April. The wheel was a major tourist success but it also had its detractors. In November 2009 the Belfast Titanic Society complained the wheel blocked access to the Titanic Memorial. And it prevented them from laying a memorial wreath. The Belfast Titanic Society campaigned for the wheel to be removed. Apparently it worked. Originally the company running the attraction had submitted an application for summer use. They have since decided to remove the wheel. The Phoenix Theatre for Children plans to present TITANIC: A Concert Version of the Musical at 8 p.m. Saturday, March 27, at the Lincoln Theatre, 769 E. Long St.
Tickets are $50 and can be purchased at the Ohio Theatre Ticket Office, 39 E. State St. or by phone at 614-469-0939. A limited number of $100 VIP tickets also are available. The VIP ticket includes priority seating and a post-show reception with the cast. Visitors to the Thompson Dry Dock in Belfast can no longer visit it for free. The BBC is reporting that it will now cost £50 to enter the area. The fee is being implemented by the Northern Ireland Science Park, the owner of the dock. The dock was opened in 1911 by the Belfast Harbour Commissioners. The 850 foot long dock was the world’s largest at the time. It is popular with tourists who want to see a real Titanic attraction. The BBC reports that it is a popular stop for bus tours. A parking fee has been added as well for tour buses, cars, and even taxis. The article states you can avoid the Thompson charge by pre-booking a site tour or by purchasing goods in the visitors center. If researchers at Queensland University of Technology in Brisbane, Australia are right, best to be on a ship sinking slowly rather than one sinking fast reports the New York Times. They concluded the rate of sinking results in either “Women and Children First!” or “Every Man For Himself!” scenarios. 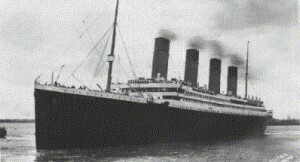 Titanic’s sinking (1912) and Lusitania’s (1915) were used to test their hypothesis. Titanic sank slowly allowing for more children and women to survive. Lusitania sank fast so women and children had a lesser chance to survive. “When you have to react very, very fast, human instincts are much faster than internalized social norms,” said Benno Torgler, an economics professor at Queensland University of Technology in Brisbane, Australia, and one of the authors of the study, published in the current issue of Proceedings of the National Academy of Sciences. I am not sure this really tells us anything new about human behavior. There were a lot of factors that played into how many survived Titanic. And “Women and Children First” was not universal on Titanic. Lightoller enforced it but not other officers. There also was little panic. Lusitania, on the other hand, is a different story. A torpedo fired from a German submarine fatally ruptured her. She went down fast and everyone had to race to the lifeboats. In such situations, there is little time. One must move fast.